Notes: Spinners are very slender in profile. They are mayfly duns that have molted their layer of exoskeleton. They do this to allow for ease of mating. Males fall into the water exhausted after mating while the females fall into the water, after they have rested and matured their eggs, which are deposited in the water. The use of quills for the abdomen does a great job in mimicing this body profile. The quills have an advantage in showing segmentation as well as the light-reflecting qualities of the natural. In addition, quills have great bouyancy and will give a tapered profile. A.K. likes to use stripped and dyed Chinese Neck hackles. A.K. 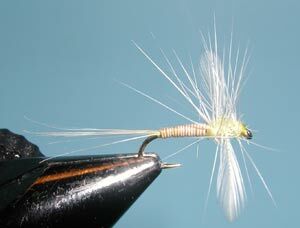 Best uses white hen hackle tips for the wings. Sometimes, Poly and Antron yarn is also used. A.K. finds that most flies use way too much of the material and he emphasizes it's sparseness. The wings are tied with a figure eight wrap to lay flat. 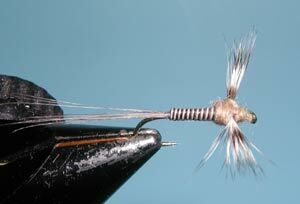 Some of his patterns will add a few turns of a hackle to help in seeing the fly but also to represent the legs of the natural. A.K. 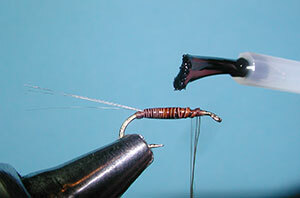 also prefers to use the fibers from a spade hackle on a good dry fly neck for the tailing material. Since Spade Hackles are getting more difficult to find, he has been using Coq de Leon hackles. Wing: Grizzly Spade Hackle, 2 sizes over hook size.